Colmar round log handler and AEC Matador. Colmar 301 round wood handler selects round logs for the sawmills. It has a rotator on the end of the boom which is very usefull when the logs require to be turned. This piece of machinery, not in use for many years, is a 'AEC 4 x 2 Matador or 'Mat' lorry'. (All AEC lorries received 'M' names i.e. Mercury, Militan, Monarch and Mustang),you can just make out a 'm' on the red radiator on the front). The Matador was distinctive with its flat fronted cab with gently curved roof, wheels at the corners and a flat load carrying area covered by a canvas or tarpaulin tilt. It was equipped with a winch (7-ton load in its case) like all artillery tractors. The O853 provided the basis for the 'Dorchester' Armoured Command Vehicle. AEC also produced a larger 6x6 vehicle (model O854) based on the 4x4 Matador which were generally, if not officially, also called Matador. For the British Army, it fulfilled a role between the Morris C8 Quad pulling smaller guns such as the 25 pdr Gun-Howitzer and the Scammell Pioneer used for the 7.2 inch howitzer, and was commonly used for the 5.5 inch Medium Gun and the QF 3.75 inch AA gun. It was also found to be a generally useful vehicle and adapted for other roles including carrying a 25 pdr gun on the back. The RAF used theirs in the flat bed form for load carrying. The 6-wheeler Matador was used as a refuelling tanker, capable of carrying 2,500 Imperial gallons of fuel and also for towing ashore Short Sunderland flying boats at their stations. In 1942/43 for the North African campaign some Matadors mounted the 6 pounder anti-tank gun to give the AEC Mk1 Gun Carrier "Deacon". 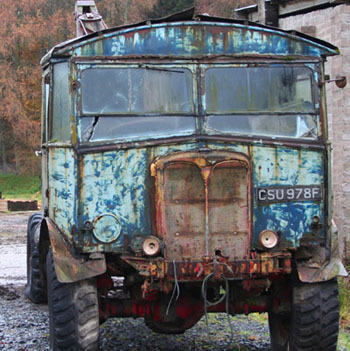 Post war the Matador was found in civilian use as a recovery truck, a showmans vehicle, and general contractor use. Also useful for forestry work because of its good offroad performance. This machine was built by a company in Denmark called System TM who specialise in automated equipment. Pieces of wood are feed automatically into the measuring station which measures the width, thickness and length. The machine then calculates the best cutting pattern to give the required dimensions of timber with the least amount of waste,(this is known as optimisation). Lengths of wood then travel along a belt to the x cut saw where they are cut into shorter lengths, the finished pieces are then automatically sorted into separate designated piles to be manually stacked.